Look, it's the Fab Five! Delightful 9-inch tall statue, beautifully crafted by Jim Shore. 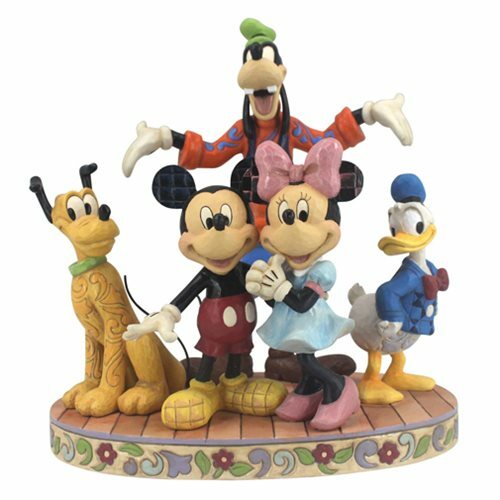 The gang's all here in this wonderful Disney Traditions Fab Five The Gang's All Here Statue by Jim Shore. It features Pluto, Mickey Mouse, Minnie Mouse, Goofy, and Donald Duck and is beautifully crafted by Jim Shore with his signature combination of unique color palette and meticulous handcrafted attention to detail. The delightful statue is made of stone resin and measures about 9-inches tall.